Everyone loves "I Love You, Man"
It has been a long time since I've seen unanimous positive consensus on a movie. I thought maybe "Slumdog Millionaire" would be the breakout, but some of my friends strongly disliked the movie. Go figure. So I was kind of surprised that my friends, future in-laws and random co-workers all gave "I Love You, Man" the thumbs up. I was expecting it to be another raunchy comedy and I was expecting to have some LOL* moments but I certainly wasn't expecting to leave feeling so happy. It really combined elements of outrageous humor and heart-filled moments in an original storyline that tied together neatly like a beautiful department store gift-wrapped present - with the exception that you cannot get from Silver Lake to Venice in 30 minutes no matter what time of day it is in Los Angeles! Borrowing from JesusH.com, 5 Pocchacos! 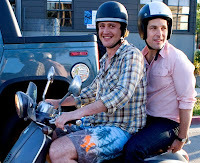 Since it's unlikely I'll ever see this -- or any other movie for the next 4 months -- I truly appreciate the photo of the two dorky co-stars on the Vespa. Thanks V-Train!